Mac OS X 10.7.3 added several new high-dpi interface elements, giving another hint that Apple may be working towards releasing Macs with ‘retina’ displays. The simplest explanation is that Apple only just now got around to increasing the resolution of these elements for the benefit of users who use the cursor-zooming Universal Access feature. But, combined with the fact that some people with Mac Minis connected to TVs via HDMI are reporting that after upgrading to 10.7.3, their system rebooted in HiDPI mode, I can’t help but wonder whether we may be on the cusp of Apple releasing HiDPI Mac displays and/or HiDPI MacBooks. I.e. : retina display Macs. The most noticeable element changes are visible when increasing cursor size, where before a pixelated cursor would appear and now the cursors are smoothed and significantly higher resolution. These higher res images could be appropriate for use on a Mac with a High-DPI display. Mac OS X Lion has provided a variety of clues that retina Macs may be coming sometime in the near future. From the unusually high res wallpapers, HiDPI display modes, HiDPI options, to the giant icon artwork, there is a fair amount of evidence to suggest that Apple is in some stage of developing Macs with ultra high display resolutions. There have also been rumors to support this idea. Late last year, Digitimes reported that Apple would release a MacBook Pro equipped with a high resolution retina display in the second quarter of 2012. There is also the expectation that iPad 3 will feature a ‘retina’ display, leading many to assume that a Mac would launch around the same time frame to support development of high resolution apps and artwork for the device. High res screenshots now required on App Store! Retina iPad and Mac here we come! Nice. It was one of my complaints since switch from windows. Why was that? Now enlarge pointer (nice, smooth), start aperture and place mouse pointer over preview image. Now you can see ugly big pixelated piece of sh.. (pointer). Now you can navigate straight to system preferences and turn it back-off. Shame. Mission failed. Actually, the picture above shows Snow Leopard, not Lion. While 10.7.3 DID have new cursors, magnifying the cursors in Universal Access never made a pixelated cursor to begin with in Lion. It always showed the cursor on the right. Try it in 10.7.0, 10.7.1, and 10.7.2. 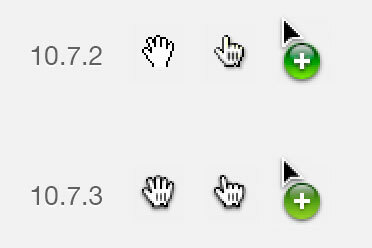 Those new hand icons are bugging me in firefox. Maybe an insignificant thing, or just something to get used to.. But, it looks so damn weird with the finger pointing to the left, and.. those micky mouse gloves..
Maybe where some graphic acceleration is involved.